Simultaneously the sequel and the original draft of the Pulitzer Prize winning classic To Kill a Mockingbird, this novel follows a 26 year old Jean Louise Finch ("Scout") as she returns home to Maycomb, Alabama to visit her aging father, Atticus. Set against the backdrop of the civil rights movement and the political turmoil that were transforming the South, Jean Louise’s homecoming turns bittersweet when she learns disturbing truths about her close-knit family, the town, and the people dearest to her. Although there persists in Watchman an idea of the primacy of the individual conscience, the novel serves to remind us that we are at a moment in our ongoing pursuit of justice that puts our national conscience at stake, and it is all the more pressing that the watchman be attuned to the collective soul of our nation. ...a deeply uncomfortable but brilliant book that ruthlessly examines race relations, and the speculation surrounding this long-unpublished novel....Maybe the reason that Watchman wasn’t published in the 1950s was because it would have been burned or, worse, ignored. Maybe, 60 years later, we’re ready to look, listen and think. Indeed, Harper Lee’s Go Set a Watchman, the most controversial 20th-century novel of the 21st century, has problems beyond its now-notorious depiction of Atticus Finch as a fallen hero. Talky and preachy, this sort-of-sequel lacks the cinematic power of its legendary predecessor. What’s more, the novel’s origin story is peculiar, and the worrisome dispute over the frail Lee’s role in its surprise release is enough to make anyone want to skip a second visit to the Maycomb of To Kill a Mockingbird. 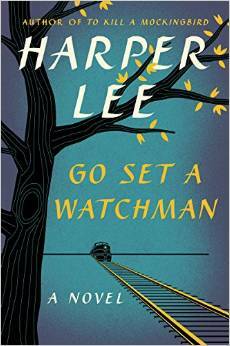 But Go Set a Watchman is hardly the horror show suggested by early reviews. As understandably rough as it is, readers will thrill to Lee’s sly humor and vivid storytelling. And those who can bear the stunning transformation of an American icon will gain insight into the minds of the polite racial separatists, those who thought men in black robes – not white ones – could preserve Southern life’s strict divides. What did you think of Go Set a Watchman?